Can I Play Super Szansa Online? Read Reviews! Why play just one game when you can have two with the same ticket? Poland’s Totalizator Sportowy gives you such a chance with one of its newest games. Super Szansa (super chance) does not exist as an independent game. Rather, it can be activated for an additional payment of two Zloty by the players who choose one of the other lotteries in the country. With a top payout of 2 million Zloty, Super Szansa is definitely worth a try. Super Szansa was launched on June 7, 2016. The game has been a supplementary option ever since its launch. It can be activated whenever players buy their tickets for other Totalizator Sportowy lotteries – Lotto, Multi Multi, Mini Lotto, Kaskada or Ekstra Pensja. Super Szansa is available with every single ticket. The digits are drawn two times per day, seven days per week. Counting starts from the last digit towards the first one to find out whether the player has won anything. Is Super Szansa a Scam? While still a relatively new game, Super Szansa is anything but a scam. Organized by a national entity, Super Szansa is an official game included in the portfolio of Totalizator Sportowy. To give you more confidence, let’s take a look at Totalizator Sportowy’s reputation. The organization was set up back in 1956 – a national entity that was originally set up for the purpose of promoting football development in the country. Eventually, funds generated by the organization started getting used for the setup and the reconstruction of all kinds of sports facilities. Many new games were added to the portfolio of Totalizator Sportowy in the 70s. Today, the organization has more than 16,000 retail points throughout Poland and it employs 2633 people. Its annual revenue exceeds 4.327 billion Polish Zloty (as per 2015 statistics). Since 2010, Totalizator Sportowy has its own television studio. This is where all of the drawings take place and they’re broadcast live. The drawing can also be watched via a live stream presented on Totalizator Sportowy’s official website. How to Play Super Szansa? 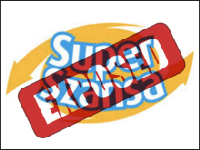 Super Szansa has to be activated when a ticket for any of the other lotteries is purchased. Players choose 7 numbers in the range from 0000000 to 9999999 to form a seven-digit number. If a player doesn’t have favorite numbers, these can be assigned randomly at the retail venue. Numbers are examined from right to left to see whether the player has won anything. At least one number should be matched to get a prize. A player will claim the jackpot whenever all 7 of the digits are matched. Currently, it’s not possible to play only Super Szansa. Thus, you will need to spend money on a lottery ticket for one of the other Totalizator Sportowy games and you will also have to pay two additional Zloty for the activation of the add-on lottery. The odds of winning the Super Szansa jackpot are 1 in 10,000,000. In order to get the big prize, you have to match all 7 digits for the respective drawing. Since Super Szansa is an add-on game, it comes with a fixed jackpot. The maximum amount a player can win is 2 million Polish Zloty or approximately 544,300 US dollars. The second prize tier features prizes for 6 matches. The prize is 100,000 Zloty and the odds are 1 in 111,111. Players who match 5 numbers will win 10,000 Zloty, those who matches 4 numbers – 1,000 Zloty, 3 numbers – 100 Zloty, 2 numbers – 10 Zloty and 1 number – 2 Zloty. The odds of winning the smallest prize are 1 in 11. The overall odds of winning a Super Szansa prize are 1 in 10 – pretty favorable for an add-on lottery game that’s so inexpensive. Super Szansa is a great game and it often produces millionaires. In 2017 alone, 6 people claimed the biggest lottery prize. There were also 19 individuals who claimed the second 100,000-Zloty prize. Would you mind rating Super Szansa? In Poland, lottery prizes are paid out in the form of a cash lump sum. Bigger prizes have to be claimed in person from the headquarters of Totalizator Sportowy. Smaller awards can be received at the authorized retail venues throughout the country. The sum won through Super Szansa will be subjected to an income tax. Amounts ranging from 1 to 2,280 Zloty are not taxes. Larger prizes will be subject to a 10 percent income tax. International players should also keep in mind that an additional income tax could apply in their country of origin. Can You Buy Super Szansa Tickets Online? While online lottery agents do carry some of the Totalizator Sportowy games, the relatively new add-on is still not available online. International players can get tickets when they are in Poland, but if you’re attempting to try the game from abroad, you’re not going to get lucky (no pun intended!). If you are a person who likes getting additional chances to win money from lotteries, you will definitely like Super Szansa. What’s not to like about it? It’s simple, it’s straightforward and it provides an additional winning opportunity with other games that you probably love already. So there you have it! Super Szansa is a lot of fun and it gets a thumbs up from us. If you have some experience with this relatively new Polish game, please don’t hesitate to share your story with us in the comments below.